There are so many great beauty gift sets to choose from each Christmas that we are now spoiled for choice. From advent calendars to massive boxes crammed with products galore... You may find this all a bit overwhelming. To help you sort through all the madness, I've decided to feature a series of beauty gifts this week that I've tried and vetted myself. Each of these gifts is different and they are all certain to impress the beauty buffs on your Christmas shopping list! The first on this list is the Salt & Pepper Body Gift from Mad Beauty. At just £14.99, this is a great option for anyone who's shopping on a budget for Christmas gifts this year, but whoever gets this under the tree will be no less impressed. First of all, everyone needs a new loofa... That's pretty much always the case as they tend to hold onto bacteria and need replacing regularly. 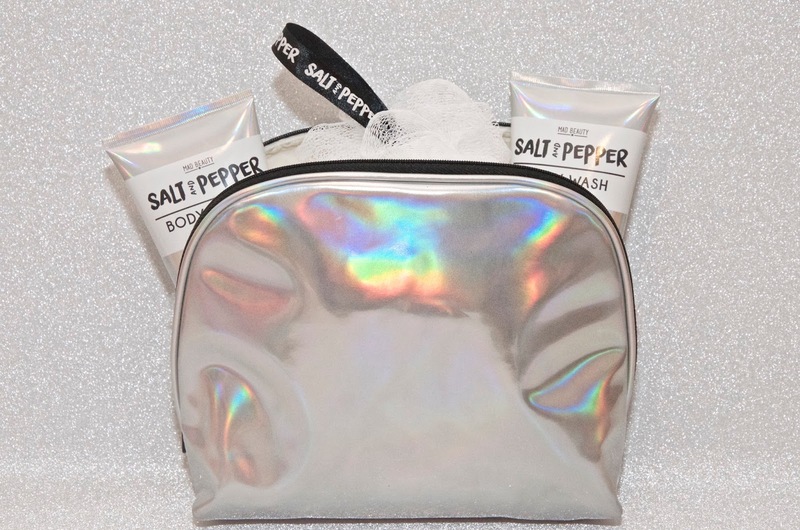 The bag these goodies come in is an iridescent, reflective silver that conjures up visions of unicorns and is perfect for storing makeup and other things or using during travel. The body wash & body lotion are positively lovely products that smell amazing, with a light, fresh & clean Ginger & Pear scent that's comforting, slightly sweet and not too overwhelming. In short, this is a wonderful gift for pretty much any lady on your Christmas gift list, however with its trendy metallic look, it's particularly perfect for tweens, teens and university students. It's useful and cool at the same time! The Mad Beauty Salt & Pepper Body Gift is £14.99. For more information or to buy, visit madbeauty.com. Be sure to come back tomorrow to see the next Swoon-Worthy Beauty Gift suggestion, featuring a wonderful luxury skincare gift that any beauty lover would be very excited to unwrap on Christmas morning!